You are a record label executive, a music supervisor, producer, post-production editor, or web designer looking for unique music licence or media applications. Licence Deal or Film Synchro Sourcing. ZE Records has been involved in music & media production since 1978 and has licensed and produced music with such companies as : Island Records, Buddah Arista, Sire, Universal Polygram, EMI, Nippon Columbia, Soul Jazz Records, Stereo Deluxe Records, K7, Strut Records, Agnes B, Nova, P.Vine Records Japan, Playstation, I.N.A. Permanent Vacation, Colette Shop Paris, Ministry of Sound, les Inrockutiples, Groovia International, Ana SUI Japan, Majorbox Music Pty. CHANEL Paris, Morningside Pictures, MTV USA, SONY Pictures Entertainement, Aperture Music, NETFLIX, Missony, Cover Girl, Warner Music Group, Comedy Central, Sony Mexico, Vissla. 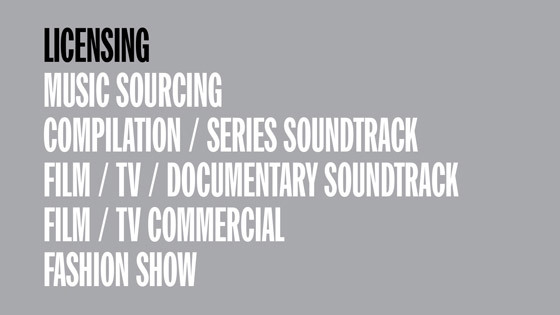 We match the right music to your visuals - TV productions, film soundtracks, commercials or internet sites. We can help you find an existing track or use our contacts with our legendary & totally brilliant artists to commission fresh material. Series: Shut Eye, Preacher, The Get Down, Narcos, Top of the lac, Greenlanders, Miracle workers, Sneaky Pete, Camping, Snowfall. Films: Barry, Blue Night, Jean-Michel Basquiat: Claiming The Crown, Six Sides of Katharine Hepburn, Animals, Bad Moms Christmas 2.